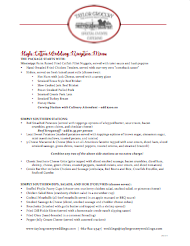 It’s our goal to help make your dreams come true by creating a reception or rehearsal menu that fits your style perfectly! Taylor Grocery Special Event Catering will take care of all the details while you enjoy your special event. This package starts with hand-breaded, all-natural fried chicken tenders, and all-natural grilled chicken tenders marinated in a zesty southern sauce. Next comes a fresh baked roll stuffed with your choice of one signature meat from the smokehouse. 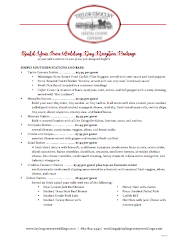 Finish out your wedding day package by choosing five of our homemade dips, salads, and hor d’oeuvres. Beverages are also included. This package starts with Mississippi farm-raised fried catfish fillet nuggets, hand-breaded all-natural fried chicken tenders, and hushpuppies. Next comes a fresh baked roll stuffed with your choice of two signature meats from the smokehouse. Finish out your wedding day package by choosing two of our simply southern stations, and seven of our homemade dips, salads, and hor d’oeuvres. Beverages are also included. This package starts with Mississippi farm-raised catfish fillet rolls, grilled shrimp skewers. Next comes a fresh baked roll stuffed with your choice of two signature meats from the smokehouse. Finish out your wedding day package by choosing two of our simply southern stations and nine of our homemade dips, salads, and hor d’oeuvres. Beverages are also included. 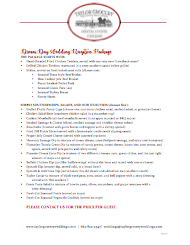 If our pre-designed menus do not fit your exact style, let’s create you one that does! Take a look at our complete menu, jot down your wants, and let’s talk about it! 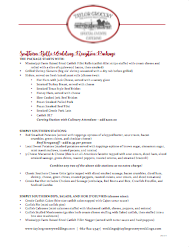 Make sure to review our Catering Policies and Sample Catering Agreement.